** Desert Essence has no idea who I am. I'm always on the hunt for the next magical beauty product. Aren't we all? For roughly the last year and a half, I have been gradually making my life more eco-friendly, cruelty-free, and health-conscious. The most difficult part of this process has been finding "clean" beauty products. Those are the products that go directly onto my skin, so you better believe I want to find some alternatives. But... those alternatives need to work too! I've had some "green" disappointments, but it makes finding good products that much more exciting. 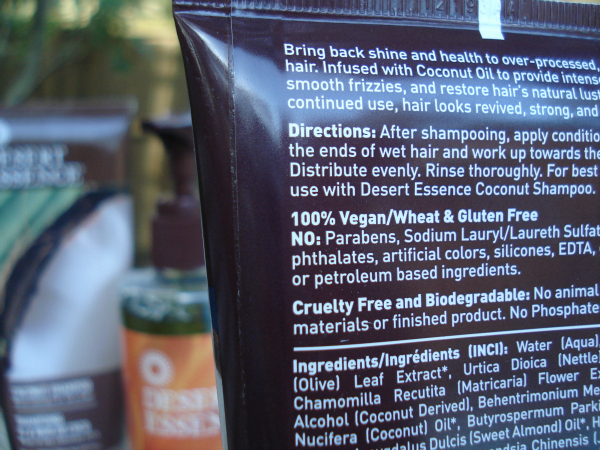 After reading online product comparisons, chatting up Whole Foods employees, and checking out product reviews, I bought Desert Essence shampoo and conditioner six months ago. Not only did I love them, but I bought more of their coconut line. I am an official convert! Also, I know that people fear the "V" word, but it is worth noting here. These products are not tested on animals. (I really wish American would get on board with Europe's ban on animal testing.) And these products are vegan! <-- There. I said it. Double-win in my book. Ready for the Desert Essence product reviews? Coconut Shampoo & Conditioner: I absolutely love the shampoos from LUSH, but I get the exact same results for half the price. Plus, these products are easier to work into my thick, frizzy hair. Coconut Hand & Body Lotion: A vegan lotion that works and lasts?! Oh, yes, my friends! It exists! I am a lotion fiend, and I'm so happy with this product. It moisturizes my dry skin without feeling greasy. There is nothing worse than putting clothes on when you feel slick from lotion! My husband loathes the greasiness of lotions, but guess what? He has no problem putting this one on his winter-kissed hands. The one catch is that the scent is a bit more piña colada than coconut. I love it, but it's something for others to keep in mind. Coconut Hair Defrizzer and Heat Protector: I need to be better about using this. I always forget in my morning stupor before straightening my hair. My hair is really coarse and frizzy, and this definitely helps. It comes out in a really fine mist which distributes more evenly and prevents the overuse and heaviness that I have to be cautious about with other shine/defrizzer products. The one catch is that you really need to use this in an open space. Since the mist is so fine, it lingers in the air a bit longer. I once made the mistake of taking a deep breath after spraying, and that did not feel good. Thoroughly Clean Face Wash with Eco Harvest Tea Tree Oil and Sea Kelp (Not currently listed on the DE website, so this is a Vitacost link): This is a really gentle face wash. I don't sensitive skin with no acne or heavy oils, and it works wonderfully for me. I'll see how it holds up against Houston's humidity and heat which will be kicking up within the next month. Give them a try. Let's me know if you have questions. I love talking about green products that I love. Just ask Gesci who picked my brain about my Crystal Deodorant review! I've been hunting around for a new moisturizer that will make my dry nose, oily forehead, pale skin (needs SPF), and guilt-complex morals happy... but most of what I'm finding is coconut and I. hate. coconut. So I found/ordered some of Josie Maran's Argan oil stuff, and just got it yesterday. 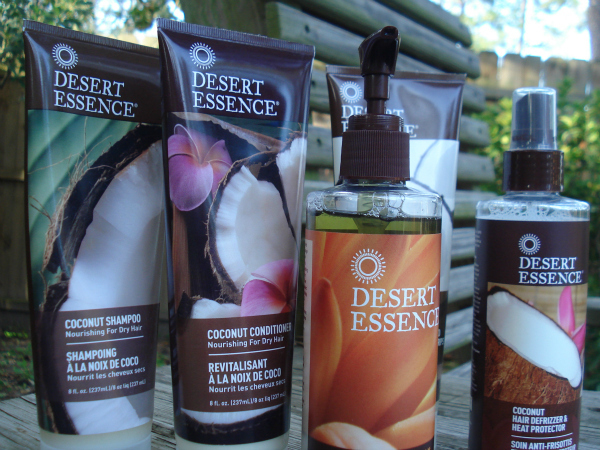 But I'm intrigued by the non-coconut products on Desert Essence... so I may have to give them a try as well. THANKS, Friend!! And yay for $10 off- I'm all over that!! Naturally, I thought the "V" word was Voldemort. My bad. I'm always looking for a new/better conditioner for my hair. I think mine is getting used to the one I'm using now. Are these products in drugstores or salons, or only online? Hmmm, this is very tempting! I may have to give these a shot! I am pretty simple when it comes to skin care and I love all natural ingredients. In fact, I think I have owned something from this line before and I can't remember what... but I remember liking it! I need to try it again. Thanks for the in depth review! That face wash sounds amazing. Anything with tea tree oil beckons me. I am also trying to move towards more all-natural & vegan products, so this is right up my alley! I'm hoping to try some of their products, especially the hair defrizzer and heat protector! I used to use that exact same face wash. in fact, I still have a large amount of it sitting in my bathroom. Unfortunately, I realized that it was severely drying out my skin, thereby actually making it more oily. I talked with a dermatologist, and he said that as long as you use any liquid soap (bar soap is the worst thing you can use on your face), you really can't go wrong. I've actually started using hand soap (like the clear Softsoap stuff) and have found my skin to take much better to that. And it's super cheap (although likely not very environmentally friendly...). I am, however, a huge fan of Dessert Essences tea tree oil. That's a magical potion for several items of business. I just wish that it were a little cheaper and sold on Amazon...I don't think they ship to APO addresses. Thanks for the review! I've never heard of this before but this sounds great. I love everything coconut. Better late than never! 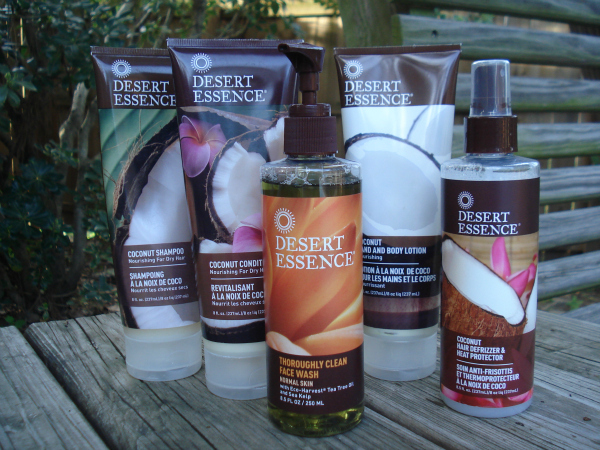 Just ordered a slew of Desert Essence products! Thank you for opening the door to a great discount site with great products!